We End Up In Some Strange Places. We will ask for 60–70–100 foot expanses of wall - depending on the scale of the challenge. They can be over two or even three sides. We do this so that we can build the conversational framework. This is the set of modules that make up the conversation we need to have to respond to the challenge. (See Above) Sometimes we get lucky. Sometimes we don’t. Often the rooms we end up in are (to be kind) less than ideal. Impossible to create a flat expanse of whitewall. So, we have to cover a multitude of sins — moose’s heads, ornate lighting, fireplaces, oriental art, stained glass windows, rare statues — air conditioning units. It’s quite a challenge. This is because such large expanses are seldom left clear. 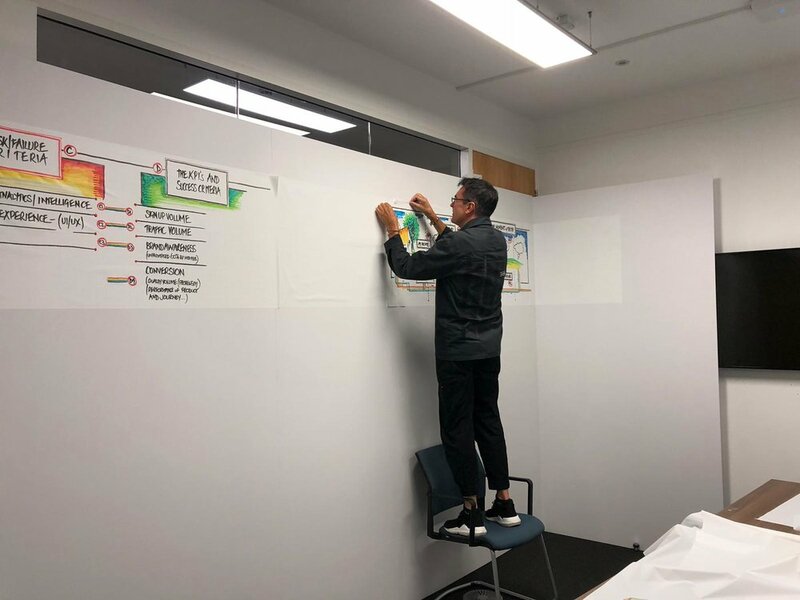 The traditional innovation or classroom space will have whiteboards screwed to the walls, plasma screens - all sorts of things. Although the instruction is for white flat painted rooms and their wall coverings are deceptive. 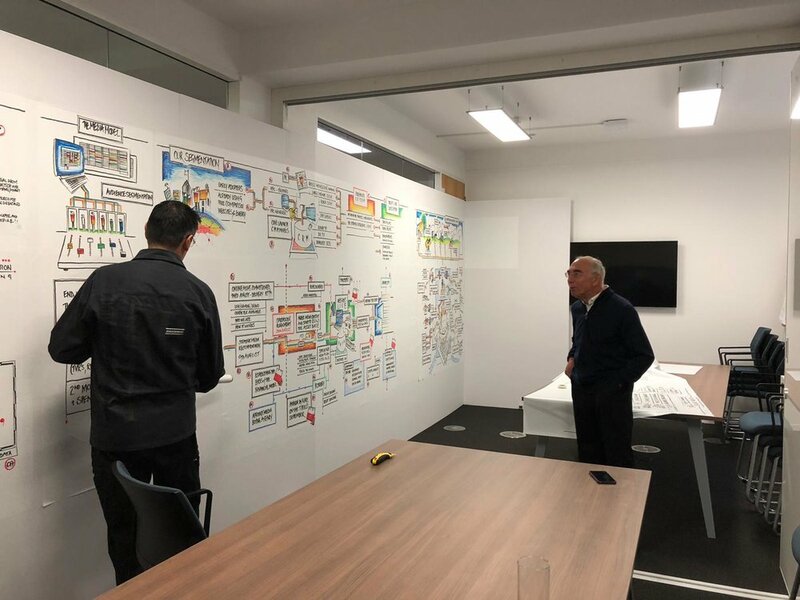 The one below looked fine from the photographs but were covered in wood chip paper - rendering them unworkable for the thin electrostatic wall covering we use to cover them to make the whiteboard. Our request is ALWAYS for flat expanses of white painted walls because that’s what we need. We need the surface and the size and scale to allow us and the team to become free to think, to be creative and for us to do the work. But somehow that gets lost in translation. I know, that’s strange right? And because we have to draw all over them they have to be sturdy. 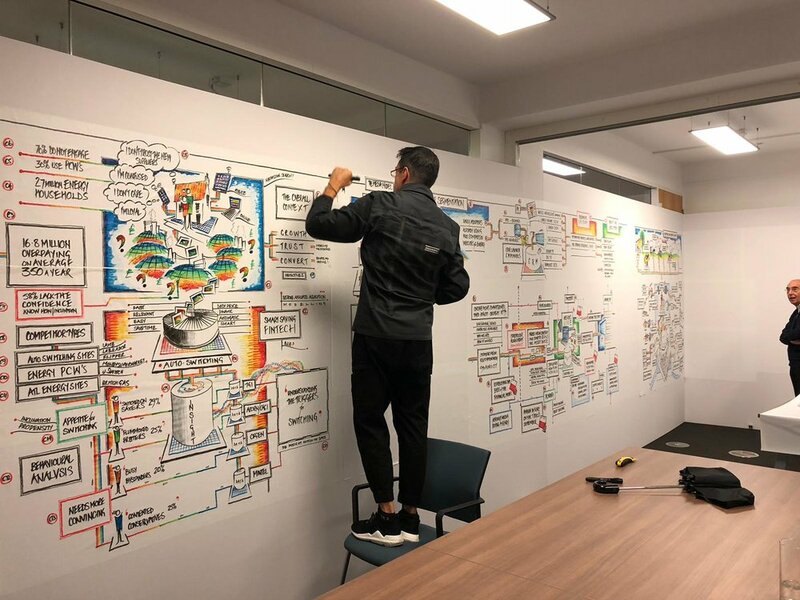 When we do find (or build a flat expanses of white painted wall we can apply really cool electrostatic vinyl materials that turn the wall into a whiteboard - in a flash. OUR WORK RELIES ON THERE BEING BIG FLAT WHITE PAINTED WALLS AVAILABLE FOR US TO PLAVE ELECTROSTATIC FILM IN ORDER TO MAKE A BIG FLAT WHITE WALL - THERE OFTEN ISN’T ONE AVAILABLE. Standing against the wall above you will see two massive boxes. They are the consequence of having a room that may well have walls but are hidden by years or poor taste, bad lighting, terrifying wallpaper, awful curtains and rubbish carpets. Mouldings, dado rails, moose heads and all other things that constitute a ‘very bad room’. They will be delivered - usually a day or so ahead of us needing them in the venue. 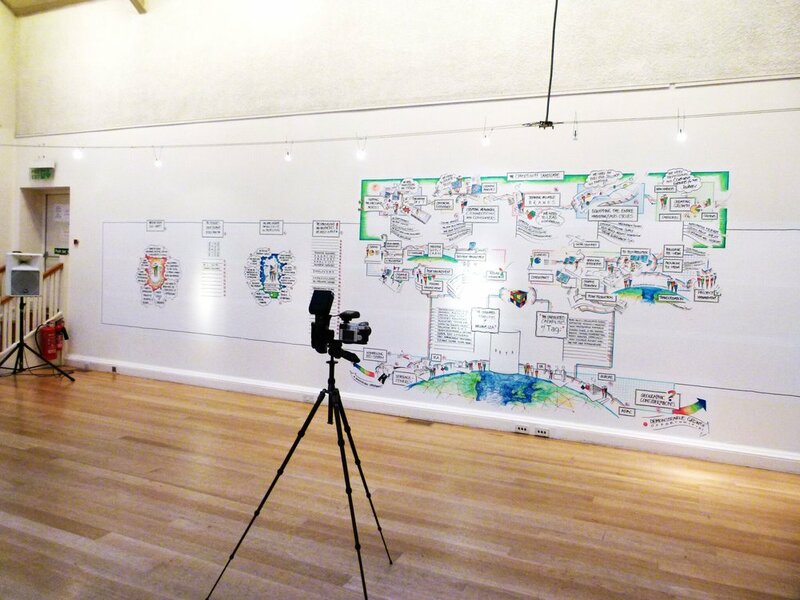 All the images here give you a flavour of how we work and prepare for stakeholder sessions. Each one varies in scope and purpose. Our walls are always unobtrusive, lightweight and readily removable. They never cause any harm or damage to the existing spaces.